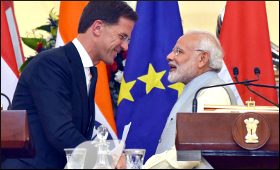 Prime Minister Narendra Modi and the Prime Minister of the Kingdom of Netherlands, Mark Rutte at the Joint Press Statement, at Hyderabad House, in New Delhi on May 24, 2018. Addressing the gathering, Rutte appreciated the efforts being made under Namami Gange programme and acknowledged the vastness of the task at hand. He said that local governments, the financial sector and the private sector as well as communities will need to join hands with the Indian and the Netherlands governments. Minister of Water and Infrastructure, Netherlands, Cora van Nieuwenhuizen also advocated trash-to-cash approach. Secretary, Ministry of Water Resources, River Development and Ganga Rejuvenation, U.P Singh said that there are more than 2,000 aquatic species in river Ganga and around 2 million people bathe in it every day. He also said that cleaning river Ganga is a continuous process. Director General, NMCG Rajiv Ranjan Mishra gave an overview of the Namami Gange programme and said that the work is being done expeditiously to achieve the herculean task of Ganga cleaning. He added that more innovations are being brought-in to have more efficiency and transparency and also to keep in mind life cycle costs.